Congratulations to Panther State Qualifiers Logan Galbraith and Devontay Moore! Also to our own 3rd Place Finisher at HWT, Jamichael Watts! We also look forward to seeing our Middle School and Elementary teams compete this season. Good luck to all! Do you have what it takes to be a panther?? 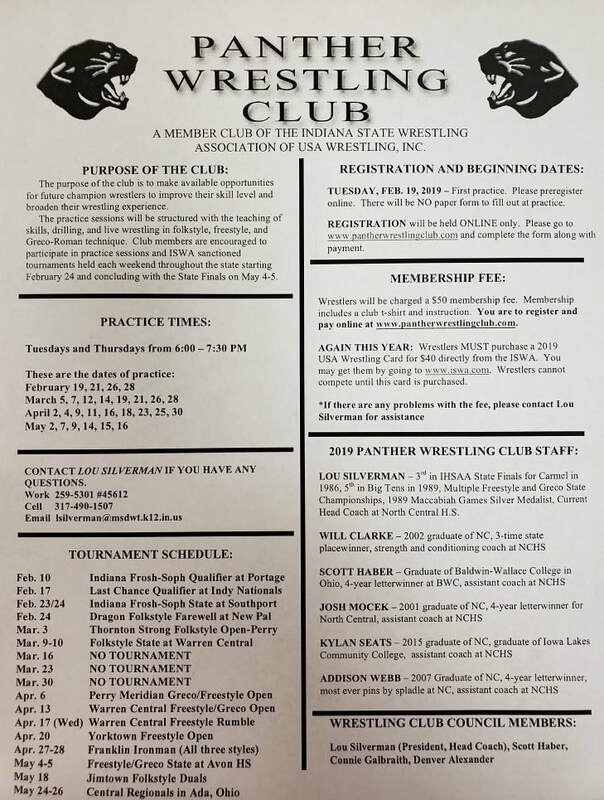 The Panther Wrestling club season is starting! Practices will be on Mondays and Wednesdays in the North Central High School Wrestling room. The full flyer with practice times is below with detailed information. Please use the registration form on the site to register for the club. Fees can be paid online using PayPal or at first practice. Welcome to the Panther Wrestling Club! We are excited for the 2018-2019 club season, and the coaching staff is hoping to build on the successes of last season's team. Practice will be on Tuesdays and Thursdays from 6:00 - 7:30 pm in the North Central High School Wrestling Room. See you there! Want to donate to the Panther Wrestling Club? Click below. We appreciate your support!